These three charts summarise the state of the labour market — and the September employment report. The good news is that the trend in hours worked is firm — in typical cycles hours pick up first, then job ads, and finally employment. The bad news is that we are still seeing job losses at a decent clip — the chart below shows that the September gross flows data revealed a spike in transitions from employment to unemployment. The monthly data is noisy, but an uptrend in separations to unemployment is clear. 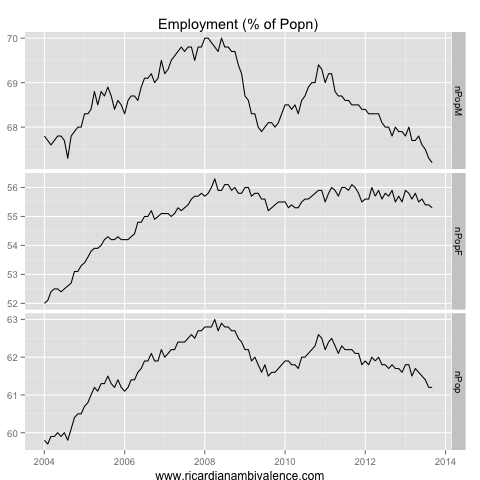 The ugly is the decline in the employment to population ratio. The decline in participation has been hiding the weakness in the labour market. It’s tough to find a job, so folks have quit looking for one. I think there’s decent prospect that the upturn in the interest rate sensitive sectors will eventually lift employment. 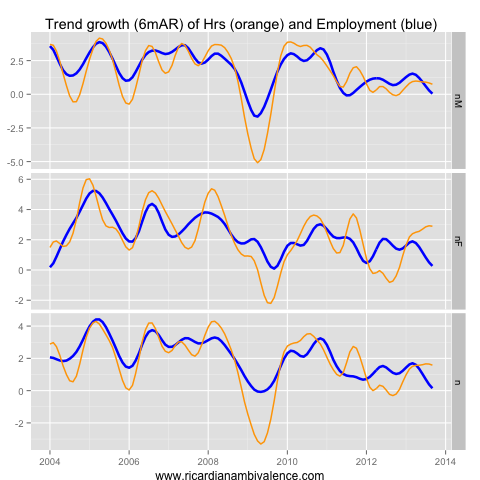 The hours worked story is a nice lead, and the flattening out (after a hug fall) of job ads is very encouraging. It’s too early to be sure that the unemployment rate has peaked, and there remain troubling parts of the jobs report, but without an ongoing rise in the unemployment rate it’s hard to see the RBA cutting again. This entry was posted in AUD, economics, monetary policy, RBA and tagged employment. Bookmark the permalink. the strongest states still seem to be the mining states. Has mining started reducing their workforce already or not yet significantly? how much mining will weigth next year vs construction picking up….. Underutilization rate must have gone higher again. yes , quite interesting and it seems contradictory to what our new Treasurer is saying! By the way our mate has three articles in today’s Around the Traps ( blantant plug) including one along side Kruggers and Menzie Chinn ( on treasury bills) and it is not out of place. Well done sir. Very flattering. How is your blog going? Still building momentum? It may be flattering but it is still true. Rajat’s your mate is in as well. Numbers are good. ATT are always high as is any article on Castle!! you should enjoy Andrew Gelman and Dave Giles. Hey I notice the numbers go up when you have more articles in!! Wow, that’s flattering. I had no idea. Perhaps it is folks linking from the comments? Loved the football piece on your Around the Traps ! yeah Vox has a pearler every so often. Me thinks readers can spot quality RA! What’s happened to Ricardo…he’s fallen off the map again? Life … I will be back.